Well folks, I finally have an image in the header of my blog. With the help of a very nice man named James. He went out of his way to help me and I really appreciate it. So stop by and check out his site http://www.thejoyofflyfishing.com. His site is also on my blog roll. I finally made it to deer camp yesterday and went shed hunting. I didn’t find any but I had a great time, just being in the great outdoors. I took a lot of photos for the site. I took the photograph in the header of the blog yesterday. I laid in the food plot and took the picture of the deer stand you see in the photo. I saw a very nice big buck this past deer season out of that very stand. The stand is on a perched on a hill and you have a lot of ground to cover when hunting this stand. You can see for a long way in every direction. This stand keeps you very busy, you don’t know which direction to look when you are hunting it. It is near the river, and is just a very good stand. I thought it would be a great image for the main header of deer hunting big bucks. The picture just doesn’t do justice for this stand. 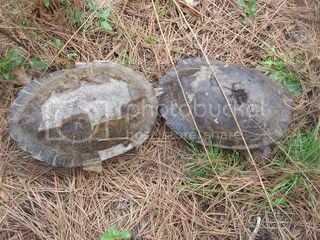 Yesterday when went for a shed hunt down by the river I found three large turtle shells. They were up the hill from the river. And I was wondering what happened. The only thing that I could think of is the river rose up and when it went back down the turtles may have washed upside down and couldn’t turn back over and died. But I’m just not sure. 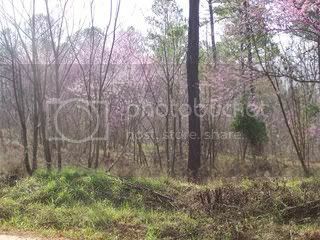 With spring finally here I saw a lot of beautiful trees blooming. I saw a fox squirrel that looked like he weighed forty five pounds, and he had climbed up onto the feeder and was eating. He needed to be on Jenny Craig’s diet. I also saw two hen turkeys. Even though the wind was really whipping and I didn’t find any sheds it was a beautiful spring day in the great outdoors. To contact Deerhuntingbigbucks.com with questions or comments fill out our contact form. Tagged shed hunt, turtle shells. Bookmark the permalink.